Degos disease, also known as malignant atrophic papulosis, is a very rare illness that affects a person’s blood vessels. When cells in the linings of veins and arteries under the skin become inflamed and swell, this restricts blood flow, resulting in spots or lesions that appear on the skin. The spots on the skin first appear small, red rimmed with a white center, and raised, but over time flatten and become depressed. The blood vessels affected include those that supply the skin, eyes, gastrointestinal tract, heart, bladder, and central nervous system. There is a spectrum of Degos disease progression. According to Dr. Shapiro, it starts on the skin and for an estimated two thirds of patients does not go beyond a cutaneous form. Approximately one third of cases become systemic, meaning that patients develop internal manifestations of the lesions, which can block blood vessels and result in a host of life threatening complications, such as bowel perforation and stroke. 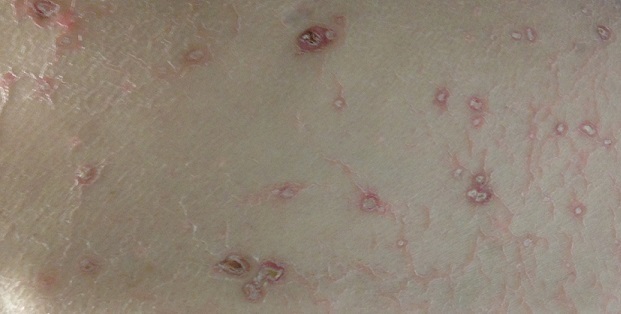 Degos disease was first described in the early 1940s by a French dermatologist, but the cause is still not known. Treatments for the condition are limited, with no FDA-approved medications available for this indication. Per the National Organization of Rare Disorders (NORD), A disease is defined as “rare” in the U.S. when it affects fewer than 200,000 at any time; in Europe, when it affects fewer than 1 in 2,000. This is the link to NORD’s information on rare disorders including Degos disease.